When it comes to the most trusted and well-known kitchen appliance brand, KitchenAid is always leading the pack. Kitchen aid is synonymous to innovation and durability, the pioneer in stand mixers, and for almost a century now, it has been providing us with top of the line kitchen appliances. It all started when its founder, Ohio-based engineer Herbert Johnston, seeing how one baker strenuously mixed bread dough with a heavy, iron spoon, set about originating the stand mixer. Since then, KitchenAid has perfected the art of creating state of the art and powerful kitchen appliances- from major appliances such as refrigerators, wall ovens, dishwashers, etc., countertop appliances like juicers, toasters, electric kettles, food processors, stand and hand mixers and many more. We have also written a complete guide about best blenders under 100. Built to last, a KitchenAid mixer is a must-have for every home- from newbies to professional chefs, bakers and cooks, you can make anything you want with this super-efficient kitchen tool. It allows you to simplify complicated recipes, cuts food preparation in half and lets you utilize your creativity. KitchenAid mixer gives you a lot of options- true to their word, this brand gives you “Everything you need to make anything you want”. For many generations now, KitchenAid mixers has been modified, developed and improved to better suit the changing times, different lifestyles and different needs, the same durable and long lastingKitchenAid mixer but with a variety of functional and advantageous attachments for different functions. One of the most tedious tasks in preparing a hearty meal for our family is the preparation of the ingredients, especially if the recipe calls for a lot of slicing, straining, pureeing, grinding, shredding, chopping, grating and more. KitchenAid’s Food Grinder effortlessly grinds vegetables, meat, fruits, cheese, and more, now you can always have freshy ground meat every timeyou need it. Grinding rice made easy with KitchenAid’s Grain Mill attachment- it is also ideal for grinding oats, wheat, barley and a whole lot more. For pasta lovers, there is a wide variety of attachments that will make pasta making so easy for you- you can make your own healthy, homemadepasta out of your choicest ingredients-the KitchenAidPasta Roller and Cutter Set lets you make pasta easily, while the KitchenAid Pasta Plates makes perfect macaroni, lasagna, and flat noodles. The KitchenAid Pasta Sheet Roller allows you to make pasta sheets of various shapes and sizes, the KitchenAid Pasta Excellent Kit can help you make dough sheets in 8 variable thicknesses. For those who favor Ravioli, theKitchenAid Ravioli Maker simplifies the process of stuffing, filling and sealing your ravioli smoothly. KitchenAid’s Pasta Cutter Set gives a lot options in choosing the kind of pasta you want. For slicing and shredding, the KitchenAidRotor Slicer and Shredder with its four Standard Cones is the ultimate attachment that gives you options for how thick or thin you want the slices to be or how fine or course you want to shred your food. Summer time is always the time for ice cream, theKitchenAid Ice Cream Maker is perfect for making the ice cream flavor of your choice-anytime of the day, it can make up to twoquarts of ice cream. For freshly squeezed juices, the KitchenAid Citrus Juicer squeezes fresh juice and strains pulp,nomore store-bought juices laden with preservatives. For delectable, savory and fresh sausages, theKitchenAid sausage Stuffer Kit is the perfect choice, you can always make standard sized sausages using the ingredients that you want. another amazing attachment is the KitchenAid Fruit and Vegetable Strainer and Food Grinder- it lets you make jams, sauces, and more, effortlessly. KitchenAid has always been the brand of choice when it comes to kitchen appliances, and their stand mixers arefavorites and can be seen every kitchen not only for their unique and spectacular attachmentsand remarkable features but also on how durable and long lasting they are. KitchenAid uses only the best and finest materials andmakes sure its stand mixers’ award-winning design is always ahead of the other brands. Not only are they tough and sturdy, KitchenAid mixers are sleekly designed and come in an array of vivid and stunning colors that earn them a place on the countertop instead of inside the cupboards. KitchenAid excels in almost everything compares to other brands- they are simple and easy to use, with that classic and elegant look, yet built with modern functionality. Reliable and versatile, KitchenAid mixers feature a wide variety of speeds and capacity. Aside from the bragging rights you would have in owning one these top of the line stand mixers, they are very easy find- online or physical stores. Compared with other brands, KitchenAidmixers are easily portable and user-friendly, they have easy to read speed settings, and burnished bowls, beaters and dough hooks that are dishwasher safe. KitchenAidhas an excellent customer support for product assistance and comes with a warranty. The price- it is definitely and undoubtedly value for your money. TheKitchenAid 7-Quart Pro Line stand mixercomes in 7-Quart or 16-Cup Flour capacity and is one of KitchenAid’slargest capacity professional mixer. It is equipped with a 1.3 horsepower motor that allows you to easily mix up to 8 pounds of batter effortlessly. It has a powerful lift design that lifts the bowl into mixing positionand locked motor protection that automatically shuts down the motor once an obstruction is detected while using the mixer. Its ten different speed settings let you knead, mix and whip ingredients easily. The power hub is perfect to use for optional attachments for grating, making pasta from scratch and a whole lot more. 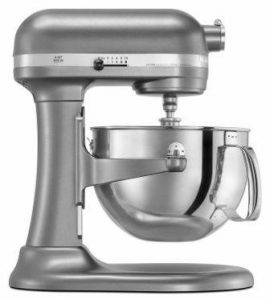 TheKitchenAid 7-Quart Pro Line stand mixer includes a flat beater, PowerKnead™ spiral dough hook, and a stainless steel six-wire whip, a pouring shield and astainless-steel bowl thathas an ergonomic handle for easiertransporting. This tough stand mixer runs quietly regardless of what speed you’re using, and it has an electronic speed sensor that maintains selected speed regardless of load. Whipping up a batch of 8 loaves of bread or 13 dozen cookies made effortlessly withKitchenAid Professional 6-Quart Bowl-lift Stand Mixer- this sleek and shiny mixer is powerful and durable enough for all your recipes and kitchen tasks, and being one of KitchenAid’s Pro series, this is an ideal upgrade if you want a more powerful stand mixer. It is so versatile, the power hub fits more than 15 optional attachments, from pasta makers to food grinders. KitchenAid Professional 6-Quart Bowl-lift Stand Mixer is made from high-quality and sturdy metal that’s guaranteed to last you for many years. Aside from Silver, it comes in two more attractive colors- Empire Red and Onyx Black. This 6-Quart stand mixer’s polished stainless-steel bowl with an ergonomic handle can accommodate dough enough for 8 loaves of bread, 8 pounds of mashed potato or 13 dozen cookies. The 10 speed settings will give you plenty of options in all your mixing tasks. Equipped with a sturdy and high-quality machine that’s powered by a 575-watt motor, and a stand, housing unit and gears constructed from heavy duty metal, theKitchenAid KL26M1XSL stand mixer will be able to handle all your tough cooking and baking tasks. Not just durable, it is also versatile- the power hub can accommodate up to 15 optional KitchenAid attachments for a variety of food preparations. 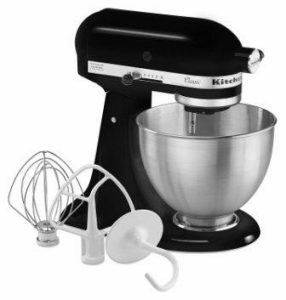 TheKitchenAid KL26M1XSL stand mixer comes with a 1-year full warranty from date of purchase. To clean and maintain- Bowlorclean it thoroughly in hot sudsy water and rinse completely before drying. Wire whip, burnished spiral dough hook and burnished flat beater should be handwashed and dried immediately. Do not store beaters on shaft. Always be sure to unplug stand mixer before cleaning. Wipe stand mixer with a soft damp cloth. Do not use household/commercial cleaners. Do not immerse in water. Wipe off beater shaft frequently, removing any residue that may accumulate. The KitchenAidProfessional 6-Quart Bowl-lift Stand Mixerincludes three standard attachments. The burnished PowerKnead™ spiral dough hook, a burnished flat beater, and a stainless steel wire whisk along with a plastic pouring shield. The KitchenAid® Pro 600™ Design Series 6 Quart Bowl-Lift Stand Mixer not only offers a generous capacity- its 6-Quarts capacity glass bowl can accommodate a batch of dough mix enough to make 13 dozen cookies, but versatility as well, the power hub can fit 10 optional attachments. The KitchenAid® Pro 600™ Design Series 6 Quart Bowl-Lift Stand Mixerhas an all-metal construction made from high-quality materials to ensure durability and long life, it has a high-glossed Onyx Black finish contrasting the included glass mixing bowl that is sure to stand out in your kitchen countertops. The gears are all steel and sturdy to ensure that they can handle even the toughest tasks. The KitchenAid KF26M22OB 6-Qt. Professional 600 Design Series also comes in two glossy and attractive colors: Candy Apple Red and Pearly Metallic. The KitchenAid KF26M22OB 6-Qt. Professional 600 Design Series includes a generous 6-Quart bowl that lets you mix a batch of dough good enough to make 13 dozen cookies or up to 14 cups’ worth cake batter, bread dough, mashed potatoes and more. It is equipped with a powerful 550 watts motor and has a variety of speeds you can choose from for all your mixing needs- its 10 speeds allow you to whip egg white meringues perfectly, mix bread dough easily, and other mixing tasks, without a hitch. Its patented Planetary Mixing Action guarantees even mixing consistency even for dense mixtures. Its bowl-lift design lifts and places the bowl into position and keeps it in place for efficient mixing. The stand mixer’s multi-purpose power hub lets you use optional attachments. The KitchenAid® Pro 600™ Design Series 6 Quart Bowl-Lift Stand Mixer comes with a 1 Year Limited Warranty and can be cleaned easily-The bowl, metal flat beater, Flex Edge beater and coated Metal Spiral Dough Hook may be washed in an automatic dishwasher or clean them thoroughly in hot, sudsy water and rinse completely before drying. Do not store beaters on shaft. Always be sure to unplug Stand Mixer before cleaning. Wipe stand Mixer with a soft damp cloth. Do not use household/commercial cleaners. Do not immerse in water. Wipe off beater shaft frequently, removing any residue that may accumulate. 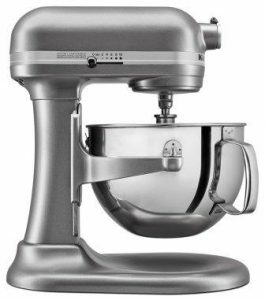 The KitchenAid® Pro 600™ Design Series 6 Quart Bowl-Lift Stand Mixer also includes an F series coated flat beater, F series coated PowerKnead spiral dough hook, F series 6 wire whisk to help you knead, mix and whip ingredients. Bakingyour favorite cakes and desserts, whipping up a batch of freshly baked breads and cookies for both a small family to a large crowd is easy with the streamlined and durable KitchenAid KSM150PSER Artisan Tilt-Head Stand Mixer, it has a 5-quart capacity that can handle a batch of dough enough to make 4 loaves of bread or 9 dozen cookies. The KitchenAid KSM150PSER Artisan Tilt-Head Stand Mixer, as well as its gears, is constructed from high quality steel guaranteed to last you for several years. It is sleekly designed and will not take too much space on your countertop. 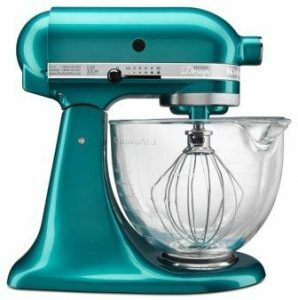 This stand mixer is finishedin a high-gloss Empire Red that will look attractive on your kitchen, but it also comes in a wide array of vibrant colors to suit your personality andkitchen theme/colors- almond Cream, Aqua Sky, Blue Steel, Blue Willow, Bordeaux, Boysenberry, Buttercup, Canopy Green, Caviar, and many more. The KitchenAid KSM150PSER Artisan Tilt-Head Stand Mixer includes a burnished stainless-steel bowl that can easily accommodate a batch of 7 pounds of mashed potatoes or 9dozen cookies, the sturdy, dishwasher-safe bowl is equipped with an ergonomic handle for comfortable handling. This sturdy stand mixer has a powerful motor that runs on 325 watts and has 10 speeds to suit all your mixing needs, dry or wet ingredients, from whipping fluffy meringue to kneading yeasted bread dough. Its unique 59-point Planetary Mixing Action ensures even and thorough mixing. The power hub lets you use up to 15 optional attachments from rolling pasta sheets, shredding vegetablesand many more. This stand mixer’stilt-head design gives full clearance to the bowl and beater allowing you to add your ingredients easily. The KitchenAid KSM150PSER Artisan Tilt-Head Stand Mixer comes with a 1-year full warranty and is easy to clean and maintain- the Bowl, white flat beater, and White dough hook may be washed in an automatic dishwasher or clean them thoroughly in hot, sudsy water and rinse completely before drying. Wire whip should be hand washed and dried immediately. do not wash the Wire whip in a dishwasher. Do not store the beaters on shaft. Always be sure to unplug Stand Mixer before cleaning. Wipe stand Mixer with a soft damp cloth. Do not use household/commercial cleaners. Do not immerse in water. Wipe off beater shaft frequently, removing any residue that may accumulate. 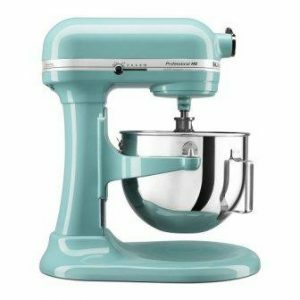 The KitchenAid KSM150PSER Artisan Tilt-Head Stand Mixer includes anylon-coated flat beater, anylon-coated C-dough hook, and a6-wire whip. The includedone-piece pouring shield snugly fits into the mixing bowl to prevent mess while adding the ingredients, especially flour, icing sugar, etc. Another outstanding and favorite mixer among KitchenAid’s stand mixer line-ups is the KitchenAid Professional 5 Plus Series, it has a generous 5-Quart capacity that will allow you to mix large batches of dough/batter. It’s sleek and sturdy- constructed from high-quality steel and equipped with a powerful motor that can handle even the toughest mixing task. It is ultra-versatile and can be used with a variety of optional attachments. The KitchenAid Professional 5 Plus Series is driven by a powerful 450 watts motor that’s is guaranteed to take on the toughest mixing jobs, the densest ofmixtures and in large batches. Its generous capacity can handle a batch of dough enough for 9dozen cookies or 7 pounds of mashed potatoes. It features a special bowl lift that supports and raises the bowl and keeps it steady in place while mixing. It comes with a burnished stainless-steel bowl that has an ergonomically designed handle for ease and comfort when lifting the bowl. The KitchenAid Professional 5 Plus Series’ unique mixing action- the beater spins clockwise as the shaft spins counter-clockwise with67 different points throughout the bowl allows for comprehensive mixing, no matter how dense the mixture. It has 10 different speeds from slow to power mixing. The power hub has a hinged cover that flips up allowing you easy installation of attachments, it also lets you use other optional attachments such as sausage stuffer, pasta maker and more. The KitchenAid Professional 5 Plus Series comes with a 1-year warranty and is very easy to clean- the Bowl, white flat beater, and White dough hook may be washed in an automatic dishwasher or clean them thoroughly in hot, sudsy water and rinse completely before drying. Wire whip should be hand washed and dried immediately. do not wash the Wire whip in a dishwasher. Do not store the beaters on shaft. Always be sure to unplug Stand Mixer before cleaning. Wipe stand Mixer with a soft damp cloth. Do not use household/commercial cleaners. Do not immerse in water. Wipe off beater shaft frequently, removing any residue that may accumulate. The KitchenAid Professional 5 Plus Seriesincludes flat beater, spiral dough hook, and wire whip. Its Overload Reset feature prevents the motor from overheating, the Soft Start Mixing feature prevents ingredients from splashing out at start up. The classy, Onyx Black finished KitchenAidK45SSOB 4.5-Quart Classic Series Stand Mixer is not only built to last but versatile as well- its Power hub is designed to fit optional attachments for different food preparations from making pasta from scratch to grinding food. Its generous 4.5 capacity is ideal for mixing large batches of dough and batter. 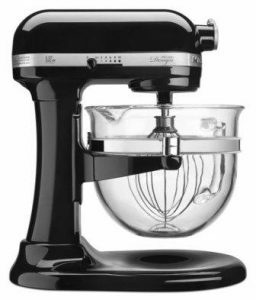 TheKitchenAid K45SSOB 4.5-Quart Classic Series Stand Mixer is constructed from high-quality steel and built to last you for several years, you can choose from two stylish colors-Onyx Black and White. The KitchenAid Classic Series Stand Mixer includes a sturdy, dishwasher-safe 4.5-quart stainless steel mixing bowl, more than ample to accommodate dough to make 6 dozen cookies or 3 loaves of bread or make 6 pounds of mashed potatoes in a single batch. It has 10 speedsthat is perfect for mixing wet or dry ingredients, you can whip cake batters for those soft and fluffy cakes or knead yeasted bread dough easily. The multipurpose Power Hub fits up to 15 optional attachments from food grinders to pasta makers. This stand mixer’s one of a kind 59-Point Planetary Mixing Action ensures thorough mixing for an even consistency. 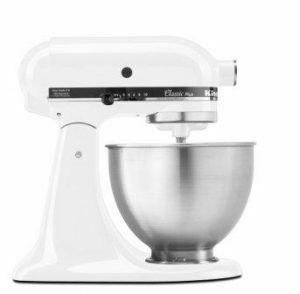 TheKitchenAid K45SSOB 4.5-Quart Classic Series Stand Mixer comes with a 1-year warranty Bowl and very easy to clean- thewhite flat beater, and White dough hook may be washed in an automatic dishwasher or clean them thoroughly in hot, sudsy water and rinse completely before drying. Wire whip should be hand washed and dried immediately. Do not store the beaters on shaft. Always be sure to unplug Stand Mixer before cleaning. Wipe stand Mixer with a soft damp cloth. Do not use household/commercial cleaners. Do not immerse in water. Wipe off beater shaft frequently, removing any residue that may accumulate. 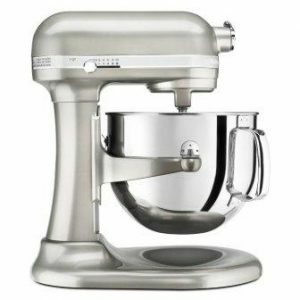 TheKitchenAid K45SSOB 4.5-Quart Classic Series Stand Mixer comes with a coated flat beater, coated dough hook and wire whip. The KitchenAid Artisan Design Series Stand Mixer will surely be a stand out whatever your kitchen theme is, with its metallic Sea Glass finish and sleek design. 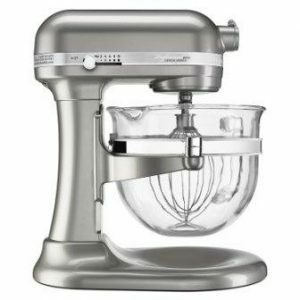 It has a 5-Quart glass bowl and 10 speeds to help you mix your ingredients quickly and with less hassle. Made from hardwearing materials, it is built to last. The KitchenAid KSM155GBSA 5-Qt. Artisan Design Series is made from heavy-duty steel- built to last. This stand mixer comes in a variety of attractive colors-Azure Blue, Blueberry, Champagne, Copper, Electric Blue,and more. The KitchenAid Artisan Design Series Stand Mixer’s powerful motor has 10 speeds to help you whip up your favorite foods- from slow to fast mixing, kneading, whipping and mixing, this stand mixer can tackle it effortlessly. Its Power Hub is perfect to use with up to 12 optional attachments from food grinders to pasta makers and more. It includes a 5-Quart glass bowl with a pouring spout and easy to read measurement markingsadds an extra touch of elegance to your kitchen. It has a tilt-head design that lets you add your ingredients into the bowl easily. Its unique 59-point Planetary Mixing Action allows for thorough and even ingredient incorporation- wet or dry, light or heavy mixtures, it can handle smoothly. The KitchenAid Artisan Design Series Stand Mixer comes with a 1-Year Hassle Free Replacement Warranty for your peace of mind. It is easy to clean and maintain as well- the Bowl, white flat beater, and White dough hook may be washed in an automatic dishwasher or clean them thoroughly in hot, sudsy water and rinse completely before drying. Wire whip should be hand washed and dried immediately. Do not wash the Wire whip in a dishwasher. Do not store the beaters on shaft. Always be sure to unplug Stand Mixer before cleaning. Wipe stand Mixer with a soft damp cloth. Do not use household/commercial cleaners. Do not immerse in water. Wipe off beater shaft frequently, removing any residue that may accumulate. This unit includes a burnished metal flat beater, a burnished metal dough hook and 6-wire whip. True to its tag line, “Mighty Power. Mini Footprint”, The Artisan Mini stand mixer hasall the power and versatility of its much heftier and bigger siblings but lighter and smaller in size. This 3.5-Quart stand mixer can whip up 5 dozen cookies in one batch of cookie dough. Versatile enough to fit optional attachments for a variety of food preparations. The KitchenAid KSM3311XFW Artisan Mini Series Tilt-Head Stand Mixer is constructed from durable and premium quality steel to ensure that it will last you a very long time. This mini stand mixer comes in a wide variety of colors to choose from- Aqua Sky Blue, Contour Silver, Empire Red, Guava Glaze, Honeydew, Hot Sauce, Liquid Graphite, and more. The KitchenAid KSM3311XFW Artisan Mini Series Tilt-Head Stand Mixer as its name implies has small footprint to fit small kitchen countertops and cupboards- it is 20% smaller in size and 25% lighter in weight. It has a tilt-head design that lets you add your ingredients easily. Its powerful motor can handle all your tough food preparations, and with its optimized 10 speeds, you can stir and mix wet or dry and light or denseingredients easily. It is equipped with a Power Hub that lets you fit more than 10 optional attachments such as food grindersand pasta makers. Itsincluded3.5-Qt. brushed stainless steel bowl can mix a dough or batter enough to make 5 dozen cookies or a loaf of bread, and much more. The KitchenAid KSM3311XFW Artisan Mini Series comes with a 1-year warranty and very easy to clean- Turn the Stand mixer off and unplug before cleaning. Wipe the stand mixer with a soft, damp cloth. Do not use household/commercial cleaners. Wipe off the beater shaft frequently to remove any accumulation of residue. Do not immerse in water. The bowl, dough hook, Flex Edge beater, and pouring shield may be washed in a dishwasher or clean them thoroughly in hot, sudsy water and rinse completely before drying. Do not store beaters on the shaft. 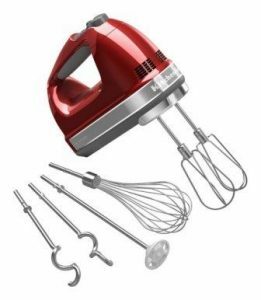 This mini stand mixer includes a coated flat beater, acoated C-dough hookand a 6-wire whip. The KitchenAid Professional 6500 Design Series is the perfect choice for all your cooking and baking needs- it comes with a 6-Quart glass bowl for mixing small or large batches of dough or batter. It has a powerful yet quiet motor, a bowl-lift design and 210 speeds to accommodate all your mixing tasks. The KitchenAid Professional 6500 Design Series has an all-metal construction including its gears- ensuring durability and longer lasting life. This sleek and streamlined stand mixer has an elegant and glossy Sugar Pearl Silver finish that would look great on your countertops. The KitchenAid Professional 6500 Design Series has a generous capacity- its 6-Quart glass bowl features an ergonomic handle and can accommodate dough that yields up to 9 dozen cookies or 4 loaves of bread in a single batch. Its Bowl-Lift designlends provides ease in raising and keeping the bowl in place while mixing. This stand mixer’s powerful yet quiet DC motor has 10 different speeds to let mix dry or wet and light or dense ingredients easily- you can knead, mix and whip without hassle. This stand mixer comes with a 1-year warranty and super easy to clean- the Bowl, white flat beater, and White dough hook may be washed in an automatic dishwasher or clean them thoroughly in hot, sudsy water and rinse completely before drying. Wire whip should be hand washed and dried immediately. Do not wash the Wire whip in a dishwasher. Do not store the beaters on shaft. Always be sure to unplug Stand Mixer before cleaning. Wipe stand Mixer with a soft damp cloth. Do not use household/commercial cleaners. Do not immerse in water. Wipe off beater shaft frequently, removing any residue that may accumulate. The KitchenAid Professional 6500 Design Series also includes a coated metal flat beater, a coated metal Powerhead spiral dough hook and a stainless-steel 6-wire elliptical whip. The heavy-duty KitchenAid KSM500PSER Pro 500 Series 10-Speed 5-Quart Stand Mixer is powerful enough to handle even the densest mixtures, it can accommodate large batches of dough or batter. Sleekly designed and made from only the finest high-quality material, this stand mixer will last you for a very long time. The KitchenAid KSM500PSER Pro 500 Series is of adie-cast metal construction, including the gears,and crafted from high-quality materials to last you for years. 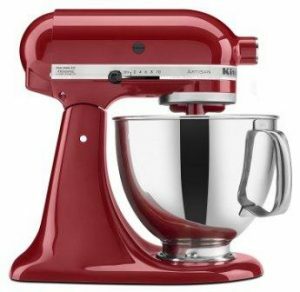 Finished in a glossy and elegant Empire Red, this stand mixer will surely brighten up any kitchen countertop. It comes in a wide variety of classy and rich colors- Black, Gloss Cinnamon, Imperial Black, Imperial Gray, Metallic. silver, Tangerine, and White. The KitchenAid KSM500PSER Pro 500 Series has a generous 9-cup flour capacity and comes with a 5-Quart stainless-steel mixing bowl. Its powerful 325-watt motor has 10 speeds and has a unique mixing action- the beater spins clockwise while the shift spins counter clockwise to ensure comprehensive and even incorporation of your ingredients. The bowl-lift design can effortlessly raise the bowl and keep it in place while mixing. This stand mixer comes with a 1-year warranty and cleans-up easily-the Bowl, white flat beater, and White dough hook may be washed in an automatic dishwasher or clean them thoroughly in hot, sudsy water and rinse completely before drying. Wire whip, Burnished dough hook and burnished flat beater should be hand washed and dried immediately. Do not wash the Wire whip, burnished dough hook and burnished flat beater in a dishwasher. Do not store the beaters on shaft. Always be sure to unplug Stand Mixer before cleaning. Wipe stand Mixer with a soft damp cloth. Do not use household/commercial cleaners. Do not immerse in water. Wipe off beater shaft frequently, removing any residue that may accumulate. The Professional 500 Stand Mixeralsoincludes a burnished flat beater, burnished dough hook, wire whip and a pouring shield. Its soft start feature eliminates splatter. It has a safety auto shut-off to prevent the motor from overheating. The KitchenAid KSM75WH Classic Plus Series 4.5-Quart Tilt-Head Stand Mixer easily mixes your ingredients, dense and light with its powerful motor and featured 10 speeds. Its generous capacity lets you mix large batches of dough in a single mix. It is made from high quality steel and finished in a classy White color. The KitchenAid KSM75WH Classic PlusSerieshas a capacity enoughto mix dough for 6 dozen cookies or 3 loaves of bread single batch. It features a tilt-head design to allow you ease in pouring your ingredients into the bowl. Its powerful motor has 10 speeds from slow to power mixing- wet or dry ingredients and light or dense mixtures, it can mix comprehensively, without effort. The Power Hub lets you fit optional attachments from food grinders to pasta makers. It also features its unique 59-Point Planetary Mixing Action to ensure even and thorough mixing of your ingredients. This stand mixer comes with a 1 Year Hassle Free Replacement Warranty and is so easy to clean- the Bowl, white flat beater, and White dough hook may be washed in an automatic dishwasher or clean them thoroughly in hot, sudsy water and rinse completely before drying. Do not wash the Wire whip in a dishwasher. Do not store the beaters on shaft. Always be sure to unplug Stand Mixer before cleaning. Wipe stand Mixer with a soft damp cloth. Do not use household/commercial cleaners. Do not immerse in water. Wipe off beater shaft frequently, removing any residue that may accumulate. The KitchenAid KSM75WH Classic Plus Series includes a coated flat beater, coated dough hook and 6-wire whip. The KitchenAid KSM3311XFW Artisan Mini Series Tilt-Head Stand Mixer, like its siblings is durable, versatile and has a powerful motor, but lighter in weight and smaller in size. The Artisan Mini stand mixer has a generous 3.5-Quart capacity and crafted from only the highest quality materials and designed to fit smaller countertops and cupboards perfectly. This stand mixer is made from durable steel and has an attractive and classy White finish, it also comes in Aqua Sky Blue, Contour Silver, Empire Red, Guava Glaze, Honeydew, Hot Sauce, Liquid Graphite, Matte Black, Matte Gray, Orange Sorbet and Twilight Blue. The KitchenAid KSM3311XFW Artisan Mini Series, small as it is, 25% lighter, 20% smaller, can accommodate up to 5 dozen cookies or a loaf of bread in a single batch. It has a Power Hub that can fit more than 10 optional attachments from pasta presser to vegetable shredder. Its powerful motor can take on the toughest and densest of mixtures. It has 10 speeds from slow to fast mixing. Its tilt-head design allows you to add ingredients into the bowl easily. This mini stand mixer comas with a 1-year warranty and is extremely easy to clean- the Bowl, white flat beater, and White dough hook may be washed in an automatic dishwasher or clean them thoroughly in hot, sudsy water and rinse completely before drying. Do not wash the Wire whip in a dishwasher. Do not store the beaters on shaft. Always be sure to unplug Stand Mixer before cleaning. Wipe stand Mixer with a soft damp cloth. Do not use household/commercial cleaners. Do not immerse in water. Wipe off beater shaft frequently, removing any residue that may accumulate. It comes with a coated flat beater, a coated C-dough and a 6-wire whip. The KitchenAid KP26M1PSL Professional 600 Series 6-Quart Stand Mixerhas a generous capacity and powerful motor that’s perfect for mixing large batches of dough, even the densest mix. It has a generous capacity. Made from durable steel, it can withstand even the toughest task. It is extremely versatile and sleekly built with a classy Silver finish to grace your kitchen countertops. 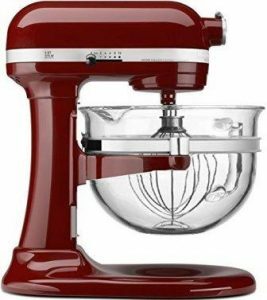 The KitchenAid Professional 600 Series 6-Quart Stand Mixer is constructed from high-quality, durable steel and comes in a wide array of vibrant colors-Candy Apple Red, Empire Red, Purple, Red, Silver, Stunning Nickel Pearl, White, and Winter Green (Dark Green). This stand mixer is equipped with a powerful 575-watt motor and has 10 speeds from light to powerful mixing. Its generous 6-Quart stainless-steel bowl has a comfort handle and can accommodate dough enough to make 14 cups worth of bread dough or 13 dozen cookies. It has a 67-pointPlanetary Mixing Action for more thorough and even mixing. The KitchenAid Professional 600 Series 6-Quart Stand Mixer comes with a 1-year warranty and is easy to maintain and clean- the Bowl may be washed in an automatic dishwasher or clean it thoroughly in hot, sudsy water and rinse completely before drying. Wire whip, Burnished dough hook and burnished flat beater should be hand washed and dried immediately. Do not store the beaters on shaft. Always be sure to unplug Stand Mixer before cleaning. Wipe stand Mixer with a soft damp cloth. Do not use household/commercial cleaners. Do not immerse in water. Wipe off beater shaft frequently, removing any residue that may accumulate. This unit includes a burnisheda PowerKnead spiral dough hook, flat beater and wire whip. The KitchenAid KF26M2XGC 6-Qt. Professional 600 is the ideal choice for all your cooking and baking needs- it is durable and long lasting. It has a generous capacity and versatile enough to fit optional attachments. This streamlined and attractive stand mixer will surely be the highlight in your kitchen. The KitchenAid KF26M2XGC 6-Qt. Professional 600 has a 6-Quart glass bowl that can mix up to 13 dozen cookies or 8 loaves of bread in a single batch. Its powerful motor has 10 speeds to accommodate slow to fast mixing. The bowl-lift design ensures support and keeps your bowl stable while mixing. Itsunique Power Hub lets you fit up to 12 optional attachments such as pasta makers and food grinders. The 67-Point Planetary Mixing Action guarantees comprehensive mixing even with dense mixtures. It comes with a 1-year warranty and is very easy to clean- the Bowl, white flat beater, and White dough hook may be washed in an automatic dishwasher or clean them thoroughly in hot, sudsy water and rinse completely before drying. Do not wash the Wire whip in a dishwasher. Do not store the beaters on shaft. Always be sure to unplug Stand Mixer before cleaning. Wipe stand Mixer with a soft damp cloth. Do not use household/commercial cleaners. Do not immerse in water. Wipe off beater shaft frequently, removing any residue that may accumulate. This stand mixer includes a flat beater, a spiral dough hook and a wire whip. The KitchenAid KHM926CA 9-Speed Digital Hand Mixer is the handy choice for your baking and cooking needs. It has 9 speeds and Soft Start™ Feature. The ergonomic soft grip handleprovides comfort when mixing. It is lightweight and super easy to operate. This hand mixer is crafted from the highest quality materials and can last for years. It comes in Contour Silver, Empire Red, Onyx Black and White. This hand mixer has a sturdy motor with 9 speeds, its Soft Start Feature prevents ingredients from splashing all over your counter. It has a beater Ejector Button that allows you to easily remove the attachments. The Lockable Swivel Cord ensures that the cord is locked on either side of the mixer to let maneuver easily. This unit is so easy to operate- just a press of the button. It comes with a 1-year warranty. Cleaning is easy- thestainless-steel Turbo Beater II Accessories are dishwasher safe. Do not immerse mixer in water. Wipe clean with a soft, damp cloth. This unit comes with 2 Stainless Steel Turbo Beater II Accessories, Stainless Steel Pro Whisk, 2 Stainless Steel Dough Hooks, Blending Rod and a Storage Bag.